This week, I remembered my rage. I returned to the University of Iowa. Iowa City after 30 years. 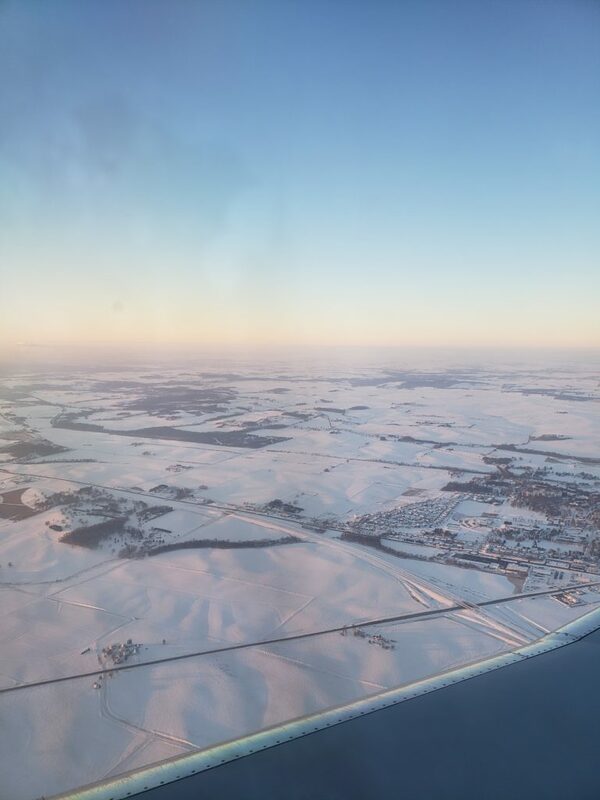 Flying into a stark whiteness of cold and snow, my heartbeat quickened in anticipation. I was invited to deliver the Martin Luther King, Jr., Research Symposium Keynote. Arriving in the evening, everything was shadowed and dark. Landmarks were not recognizable. It was if I descended and dropped into an unfamiliar world; yet it was my Alma Mater. My beloved and nourishing mother. How could a mother become unfamiliar? 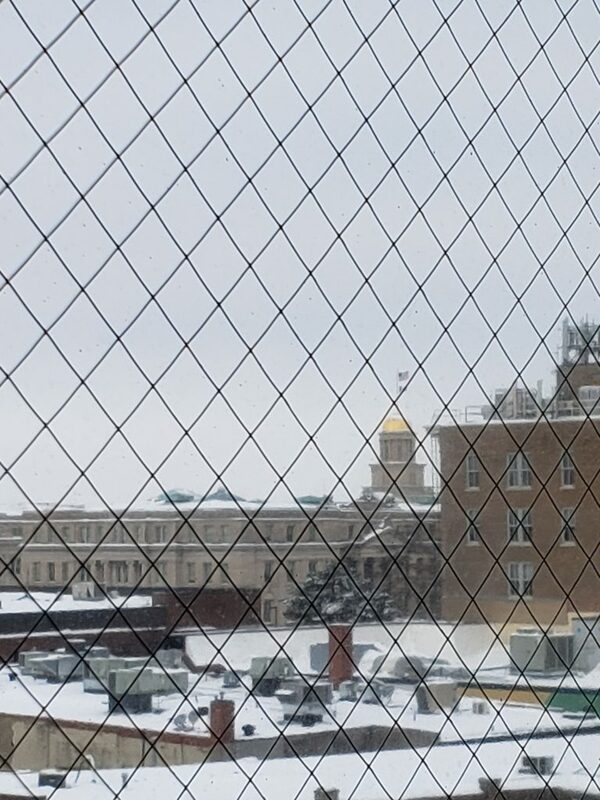 I waited for morning to come and daylight to illuminate a landmark; to shine a light; and out of a hotel window, I saw the familiar capital gold dome on the Pentacrest. Every campus has their iconic spaces. NW WINDS WILL GUST BETWEEN 30 AND 40 MPH. WIND CHILLS WILL DROP TO 20 TO 30 BELOW. * WHERE…PORTIONS OF EAST CENTRAL, NORTHEAST AND SOUTHEAST IOWA. * WHEN…FOR THE WINTER WEATHER ADVISORY, FROM 6 AM THIS MORNING TO 9 PM CST THIS EVENING. I wanted to cry. I remembered. I remembered I hated Iowa winters. They were cold; very cold. They felt long and miserable. And here I was, back in the misery. But as I walked the familiar pedestrian mall, through the campus mall, to the Education Building, I thought about the Iowa of 30 years ago. I thought about how grateful I was for Joe Henry and Diana Sproles – African Americans – still at Iowa 30 years later – fighting the good fight daily – recruiting and retaining underrepresented minority graduate students; running the Summer Research Opportunities Program; and being a back for students of color to climb upon to succeed. I was so grateful to see them; to thank them; to recognize them. 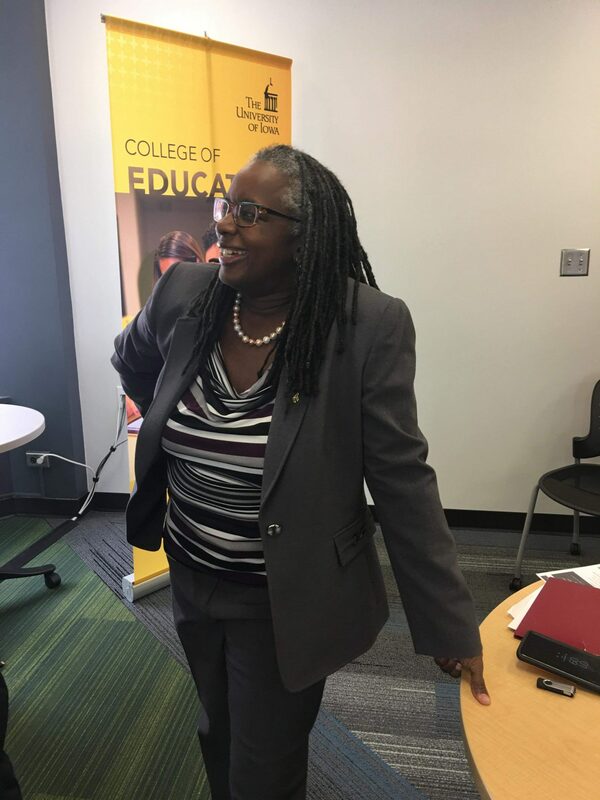 We often ignore these singular individuals who are transformational leaders, without titles of leadership, without authority, but literally responsible for the recruitment and graduation of hundreds of students of color across campuses across the United States. Joe and Diana arranged time for me to meet and talk to graduate students of color. I had a chance to share the amazing work that Virginia Tech is doing in diversity and inclusion and to encourage them to take a look at us. There are other signature individuals at Iowa. 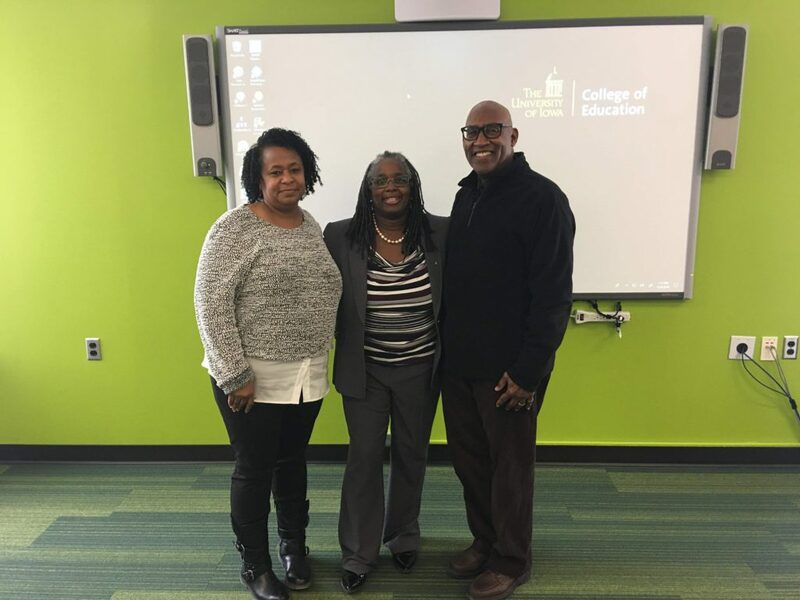 I was grateful to see Adrien Wing – a law professor who so influenced my thinking about going to law school. Her work on critical race feminism is legendary. 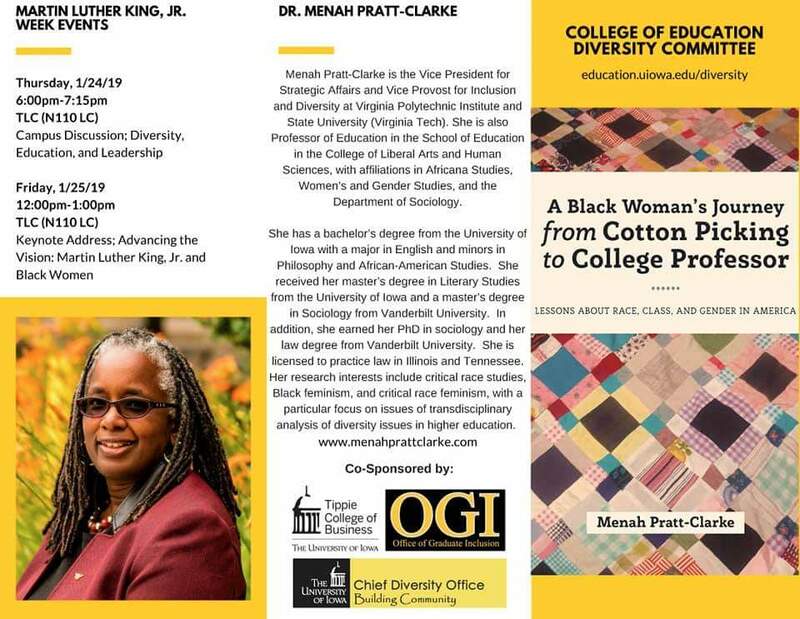 We need to be in the presence of amazing women of color scholars. It is so powerful. At the same time, I was so glad my favorite philosophy professor –Richard Fumerton. He made time to have tea with me. Thirty years later, we talked – like colleagues – about administration, faculty, shared governance, and the challenges and opportunities in higher education. We had played tennis together –those many years ago. It was refreshing to see him and I got to tell him I grateful I was to him for being my teacher. Having professors who care and love their field teach students is powerful. We often think we can replace a professor with a graduate student – but often students miss out on the experience and wisdom that a senior faculty member brings. The next day, I had hope about the weather – maybe not so cold. I woke up and my phone said -11. I wanted to cry. I literally climbed back into bed. Negative eleven. Oh goodness. As I lay back down, I thought about what Iowa gave me. I thought of my five years there and what I took from Iowa when I left. The return reminded me of my rage. My intellectual and academy journey of social justice started at Iowa. I majored in English – because all I thought I wanted to do was read books. I loved the program here – combining literature with culture. I minored in African-American studies and philosophy and began to understand the history of oppression of African-Americans, and began to learn through philosophy how to think, how to question, how to interrogate. When I fell in love with William Faulkner, I did a honors’ thesis on five of Faulker’s novels, looking at his portrayal of Black characters and stayed for a master’s degree to master Absalom, Absalom. I was beginning to learn more and to more deeply think about the issue of history, race, and Blackness in America. As an undergraduate, I read James Baldwin and understood the rage and anger that racism causes. It enabled me to begin to develop a consciousness and conscience about injustice. My academic experience was complemented by work. I became an independent student. My mom paid for my first year of college with her savings and regretfully told me I needed to try and make it on my own. And I did. I worked several jobs, as a waitress at Golden Corral, and then on campus, working with Upward Bound and Special Support Services. I am also deeply grateful to the director of the Honors Program — Sandy Barkan. When I ran out of money, she personally loaned me a substantial amount of money out of her own pocket, to continue school. She told me to pay her back as I was able. It took me years to pay her back, but I did. I wouldn’t have finished Iowa without her. At Iowa, I had many jobs and one Diana suggested to me — an after school program for Black 6th grade girls in Cedar Rapids. The after school program –Youth in Action — really impacted me. I – a young woman myself, was responsible for working with Black girls – young Black girls. I began to see another world; a world of disadvantage; a world of challenges, based on gender, race, and class. I began to feel that I was going to need to do more to make a difference in the world. Iowa gave me anger – a wild, undirected passion. Righteous indignation at the world; at life; at the unfairness of it all. I left Iowa with an anger, a rage, a deep pain, and an almost unspeakable trauma caused by the mere experience of being a Black woman in America. I knew I couldn’t stay in literature as a career. I needed to do more because literature wasn’t going to help me address the rage. I’m grateful to Iowa for that rage. As I reflect on the importance of rage, I often think of Brittney Cooper and her work — Eloquent Rage – a book about Black women’s anger and the channeling of it. I often think that if others and if more became more angry, with a rage, society would change faster. Rage and anger – a powerful energy — an energy that can be channeled for justice — that be revolved, turned around — for good. I believe all great leaders, like Martin Luther King, Jr. have deep rage – simmered and stewed, yet expressed eloquently, channeled towards good. The aggressive and persistent pursuit of knowledge about the world and injustice should create rage – or at least a range of emotions – anger, frustration, helplessness, sometimes even guilt. And then we need to do something with our rage. Right now, as a nation, as a world, we need to begin to develop a very strong righteous indignation towards injustice, toward issues of humanity. towards government workers not getting paid when we know most of America lives paycheck to paycheck; towards police killing of black Americans; towards differential health care; towards pay inequity for women and minorities; towards immigration policies when all Americans, other than Native Americans, are immigrants; towards the differential treatment of largely White Americans impacted by the opioid crisis and Black Americans impacted by crack. All drugs – all addictions. One leads to a war on drugs and the other leads to the Opioid Crisis. One gets the investment of millions of grant dollars to address the crisis, compassionately; and the other gets the investment of millions of dollars in the criminal justice system to address the crisis criminally. One population gets compassion, and another gets incarceration. Black Americans remain incarcerated at the highest rates in the world, and Black women are among the fastest growing prison population. Iowa started my journey of rage. The return reminded of me of my youthful, wild, uncontrolled, unrestrained, undirected, rage. I have spent thirty years managing and mitigating the rage. I am still angry about injustice, suffering, and inhumanity. Education should do that. It should teach us about the world; create passion about social causes; and compel us towards action to make a better world. Rage should lead to revolutions — righteous revolutions. Revolutions – a turn around. A fundamental and relatively sudden change in political and social power when a population revolts due to oppression and political, social, economic injustice. Rage should lead to revolutions – to the work of turning around injustice, towards creating and building coalitions and collaborations for change; to do things differently; to move in the world in a different way. Revolutions happen in community; in communities of trust and shared struggle, shared empathy. In Black, Brilliant and Bruised, https://www.intelligenthq.com/education/being-a-backbone-black-brilliant-and-bruised-the-story-of-dr-pratt-clarke/ I share about what it means to be in the academy. We often have been so bruised as women of color that we often don’t know how to not bruise — sometimes ourselves, as we also bruise others. Our way of being sometimes is brusque, abrupt, and edgy. We bump into other women of color; and there is no time to notice or apologize. Sometimes it is unintentional — we don’t even know we bumped them; but sometimes, it is deliberate. We sit in our bumper car of our career and we deliberately steer directly into the front or rear of another in her bumper car career. Sometimes we are reckless and vicious. And we intend to hurt and we are not apologetic. In either case, the bumping – deliberate or unintentional or unaware – often causes bruising to psyches and spirits. It shatters our sense of sisterhood, our expectation of unity, of shared struggle because of shared skin color, shared gender, and shared humanity. The tears we cry from our bumps are hot and heavy and painful. I am sure I have caused bruises to others – even if unintentional. I regret that. The sisterhood of women of color is so powerful. I see it on Facebook. I have watched with a little tinge of being on the outskirts as women of color on Facebook recently celebrated gloriously the anniversaries of their sororities. Sororities — special communities with shared secrets, shared codes, shared squeals, and shared hand signals. I never joined one. I did think about it – briefly — until I saw how Black girls were pledged at Iowa. One night – randomly walking – I saw four Black girls dressed as “pickaninnies” “selling” toilet paper outside a bar on a cold winter night. It’s an image I still remember 30 years later. I couldn’t stand to see them like that and I just couldn’t imagine myself going through an initiation, of being humiliated to be part of a community — even though I longed for the sisterhood – whatever that meant. Yet, over these many years, in many different ways, I have tried to create communities for women for color. This week, at Iowa, I felt the power of that amazing sisterhood. 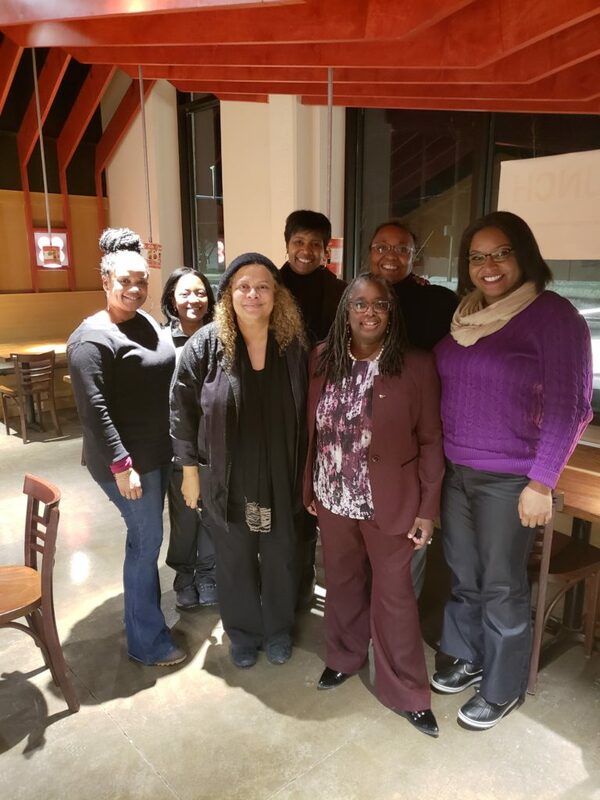 When 7 of us – all Black women in the academy – sat down for dinner, I was reminded of the power of sisterhood in the academy. Some had long careers at Iowa; others early in their careers. We talked, we laughed, we shared for hours. It was wonderful. In the academy, we need support groups and we need a sisterhood. And that, is the reason for the Faculty Women of Color in the Academy Conference. It is a support group and it is an activist group because our mere coming together as women of color is a statement. It is revolutionary. The Faculty Women of Color in the Academy Conference, http://www.cpe.vt.edu/fwca/ now in its 7th year and hosted every April at Virginia Tech brings together almost 500 faculty, graduate students, administrators and often presidents to share their experiences and to inspire and encourage others. I’m so grateful for Virginia Tech’s willingness to host this conference and to the institution’s commitment to diversity. Why is this gathering so important? We know that the mere act of being a woman of color in the academy is a social justice act. Our coming together is revolutionary. Our united stand is powerful. There are so few of us — women of color in the academy. Among tenure track faculty, Black women are 1.8%, Hispanic women 1.55%, and Native Americans 0.07%. If we can help support, empower, inspire, and encourage one another, may we do so, and then join with others – men of color, White men and White women also in the cause – to create the world imagined by Martin Luther King, Jr. 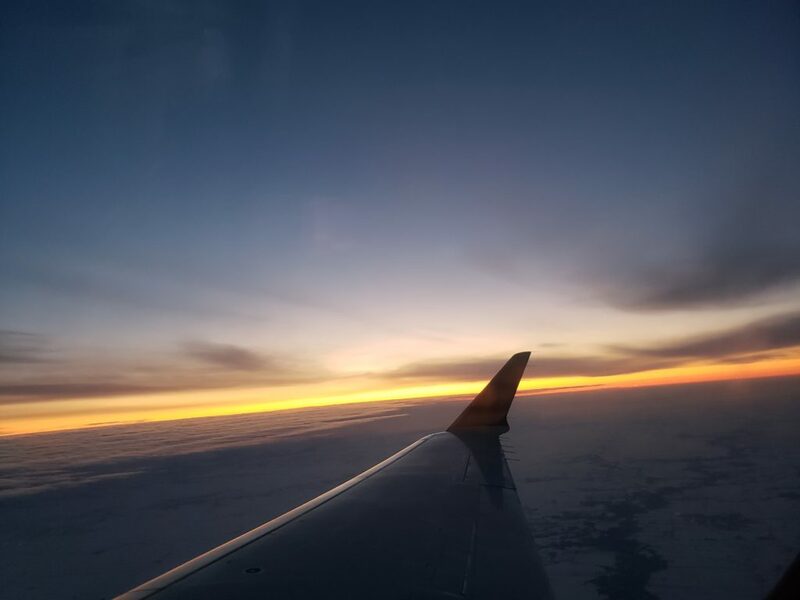 I left Iowa encouraged — the setting sun a reminder of the revolutions in the universe that return us to our beloved and nourishing mothers — Alma Mater.